We went to Paris last week. Me, J and the Shorties. I was excited by the prospect of showing them the City of Light and for a chance to be in Paris with plenty of free time to explore. It was an adventure. 1. International Air Travel in the days of personal screens, iPads etc can actually be pretty manageable. Just don’t expect Les Petites to like the airplane food, even if it is the children’s meal. 2. Jetlag is a nightmare. No way around that. So just accept that for the first few days you may be sleeping the day away, so embrace the night. 3. Sort out your local transportation. 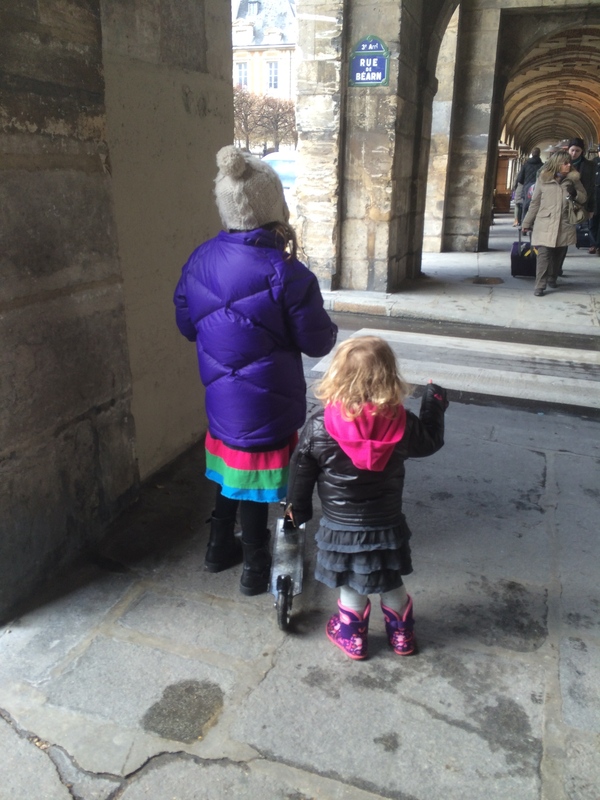 Paris is best explored on foot, except when you’re rolling with a 2 and 7 year old. Various transport devices for the Shorties was the only way to go. Stroller, carrier and scooter gave us options for them to move around and still be able to walk for miles. 4. Bribery is awesome. Nothing like a macaron at the end of a long trip to convince La Petite to carry on. 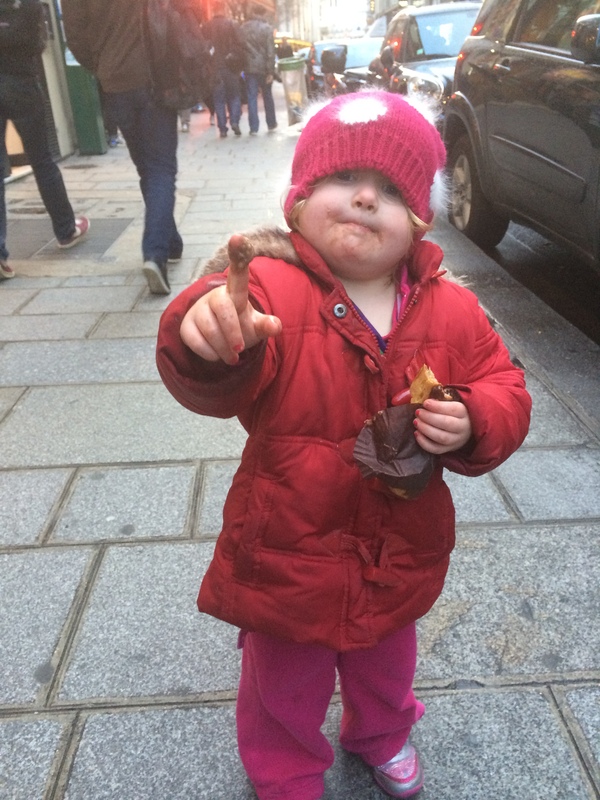 Shorty #2 enjoys a proper chocolate eclair and wonders if she’s found poo inside… Tres charmant! 5. Don’t expect them to be fascinated by all the incredible art and history around you. Rather let them be fascinated by the things that they find amazing. Case in point, we took a trip to Versailles. Shorty #2 was fast asleep on my back (NOTE: they do NOT allow strollers in the Palace – that was an AWESOME discovery as we reached the front of the line) and #1 was walking along the tour with us. I gave her the task of counting all the suns she could see (good on Louis XIV for picking an emblem that’s easy to spot and placing it everywhere in the palace, thanks for that dude) but by the time we reached the Hall of Mirrors she was done. “I’m bored” followed quickly by “I’m tired” and then followed by “Can we GOOOOOO”. It was the moment we had been waiting for on the tour and she decided now was the time to fall to pieces. Luckily the Hall is filled with statues in various states of undress. The Sun count very quickly became the Weiner count. She laughed through the whole thing counting penises on the statues and every little naked cherub in the room. I was pretty grateful for that revelation! So the moral of this story – be brave, go with the flow and enjoy the moment. 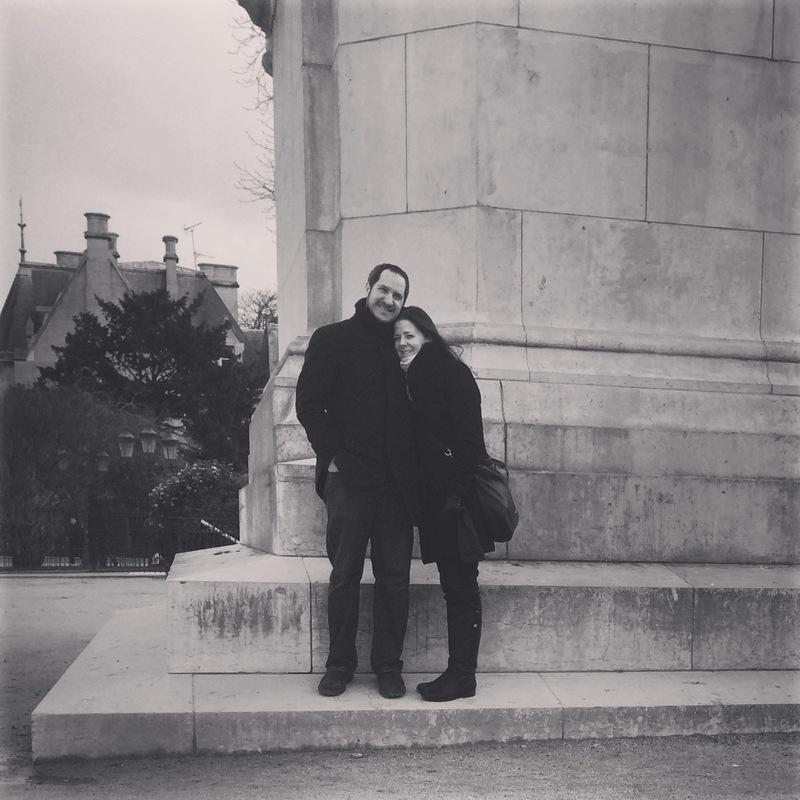 By embracing the simple things on our trip we were able to experience Paris and actually have a great time as a family. Love the creativity around keeping the elder shorty engaged at Versailles…hilarious! I loved it! Your postings make my day. So true to life and so funny. You’re the COOL rock and roll mom for sure!